Superbly built and a surprisingly good sound for live or recording duties. The GP is a great bet for a main guitar choice, or a second as a spare or alternately tuned. An all-rounder. Compact. USB output is handy. The plastic-mounted output jack and plastic strap button don't fill us with confidence. Although from 22 new Martin models and limited editions released so far this year, only four have three-figure prices, it's those that will be unquestionably the biggest selling. Ed Sheeran's X Signature and the slightly down-sized Dreadnought Junior have certainly grabbed the headlines, but two other X Series models, released earlier this year at the Frankfurt Musikmesse, are far from insignificant. The GPX1AE is the first Grand Performance shape in the X Series and, not counting the $10,999 SS-GP42-15 NAMM Show Special, is the only non-cutaway in this shape. It's an electro with a USB recording output, and while it doesn't come with a gigbag, it retails at a very tidy £559. 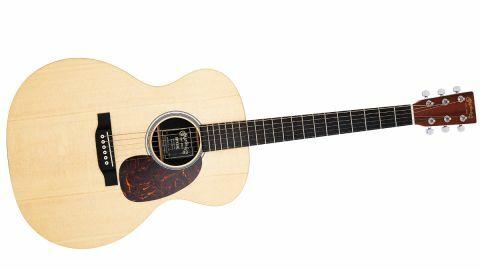 "The Grand Performance body shape is undeniably Taylor-esque, and first appeared in the all-cutaway Performing Artist series..."
Like the Dreadnought Junior, the X Series guitars are made in Mexico. But unlike that model, which aside from its Richlite fingerboard and bridge is all solid wood, these X Series models feature just solid spruce tops (the X1 part of the model name refers to a solid spruce top with 1 Series- style bracing): the rest is either laminate or synthetic. Here we have the high-pressure laminate (HPL) back and sides with its highly realistic-looking mahogany-like texture and coloration paired with a multi-laminate neck made from around 37 slices, at its widest point, of birch - like thick, just under 2mm, veneers stacked together. The Grand Performance body shape is undeniably Taylor-esque, and first appeared in the all-cutaway Performing Artist series, where the current GPCPA5 shares exactly the same specs as this model except with a cutaway and Fishman's F1 Analogue pickup system as opposed to the Fishman Sonitone USB setup here. With its Taylor Grand Auditorium-like size (it's actually very slightly smaller), the 502mm x 399mm body size is a different proposition to the much more compact 00, which is trimmer in depth, too. The Fishman Sonitone under-saddle comes with volume and tone controls placed inside the soundhole. There's no side-mounted preamp - the actual preamp board is attached to those soundhole controls, while the output jack is placed on the side, on a simple plastic plate that also houses the battery and the circuitry for the mini-USB output. While there's a reassuringly solid feel to the guitar, this plastic side plate doesn't fill us with confidence stage-wise - it's fine for the battery holder and indeed the USB output, but we'd really prefer the jack output to double as the base strap button, which here, in Martin style, is a plug-in plastic type, like an enlarged bridge pin, that is simply a push fit, albeit firm, into the base block: conjuring visions of straps falling off and wrenching out jack sockets at your nerve- ridden open-mic slot. The GP has plenty in common with the 00X1AE in terms of its upper mids and highs; very Martin-like, beautifully ringing, zing-y and shimmery. The larger body of the GP gives it a chunkier feel, too, and in lower positions, the rounded but not over deep, and slightly wider, neck really feels bigger than the almost delicate, soft V of the 00. The GP kicks out plenty of volume and is capable of real room-filling projection. It also gives a fair sound representation when amplified. With a little onboard help, using the tone to subtly roll off the zing, and with a little outboard help to thin the mids and clean things up a little, strumming in lower positions, we'd be happy enough. Although obviously a little piezo-like and unnatural in the midrange, and on higher-fret excursions, the sound really isn't a million miles away from our reference Martin Dreadnought costing over twice the price. But it's as a recording guitar that we would really hear the benefits. That's not to say we'd be recording our introspective fingerstyle solo record with either:for Americana or rock, and other styles where a rhythm bed is so important, this guitar excels.